"I wanted to go to Point Park since I was in middle school. My sights were always set on being part of the communications program that I thought was ahead of the game and would prepare me well for a career in the industry." My career path has taken me up and down the east coast. 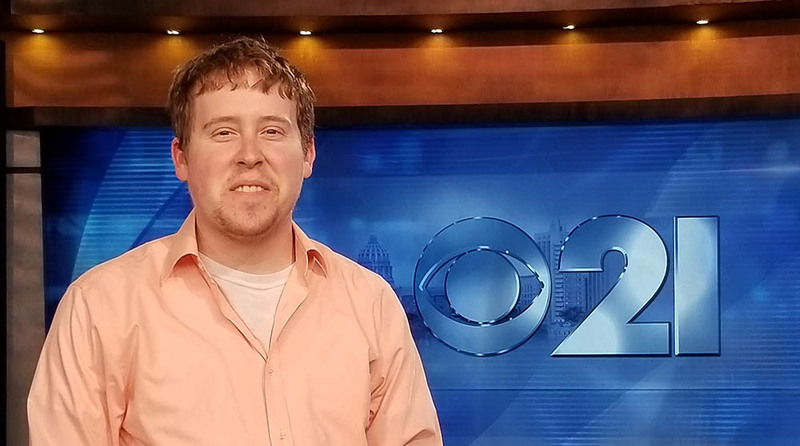 I was offered a job at WTVM in Columbus, Ga., a month after graduating in May 2015. I started as the noon producer, then a few months in I was given the reigns of the two-hour morning show. I had the opportunity to completely restructure the show and take it in a new direction, which also helped improve ratings. In July 2017 I was offered a position at WHP in Harrisburg as the producer for the 5 and 5:30 p.m. shows. I've been there since. What do you enjoy most in your current role and why? I really love the fact that I get the chance to inform the community and bring to them stories that they aren't going to see anywhere else. I enjoy putting a fun and compelling newscast together that people want to watch. Why did you choose Point Park University for your undergraduate degree? I wanted to go to Point Park since I was in middle school. My sights were always set on being part of the communications program that I thought was ahead of the game and would prepare me well for a career in the industry. It's really hard to list everything that helped me because there were so many things. However, I will say that Point Park professors who have experience in news have impacted me most. I keep in touch with professors like Gina Catanzarite, Paul Coatsworth, Robin Cecala, Michelle Wright, among others. They still give me advice to help me improve as a producer. Additionally, every role I had as a part of U-View (director, producer, crew member) has played a major role in my career. We created quality newscasts, just like the ones you will see at a local station. What career advice do you have for School of Communication students? The advice I would give School of Communication students at Point Park is to take advantage of all the activities. Get involved and stay involved with U-View because there are very few things that will prepare you more for the real world. Don't be afraid to pick the brains of your professors. They will help you get into a career and move forward. Tell us about your recent Emmy nomination. Being nominated for my first Emmy Award as the producer of Honoring Fallen Heroes: The Memorial for Ivan Flansch & Zach Anthony has been a surreal experience. I am so honored to be part of this exclusive club because I never imagined it could happen to me. This has encouraged me to produce even better newscasts going forward so that this isn't the last time I'm nominated. I don't think I would be where I am in my career if it weren't for Point Park. The four years I spent there were some of the best of my life. I've made lifelong friends while attending classes there. One last piece of advice for incoming students reading this: do what you can to make the most of your time there because it will be amazing!